Today, I'm gonna talk about how to handle error in SQL Server using THROW. In versions prior to SQL Server 2012, you can use @@RAISE_ERROR to generate error messages dynamically or using the sys.messages catalog. This error is caused by the value does not fit into the decimal data type. If you want to know if a table has a primary key or foreign key, you can find out this in many ways. Just follow these steps on this tutorial. SQL Server 2016 Hosting - HostForLIFE.eu :: How to Automate Restore All Transaction log Backup Files ? On one of my servers we had to recover ten databases using last night's full backup and all subsequent log backups. Therefore within the middle of the night it had been about to be huge challenge to manually choose each log backup file to restore. So wrote this script to create commands to restore log backup files which can be then run in an exceedingly query window. Please follow the steps below to use the script. 2. Copy all the transaction log backups to a new directory. You'll prefer to begin copying the files. That were taken a couple of minutes before the full backup was taken. You'll choose to copy the last file you wish to be restored based on the recovery point of your time. 3. In the following line set the directory where you copied the log backup files to. 4. The below code will set the directory to where the log backup files have been copied. 5. Now, Copy the output which should have the RESTORE commands and run them in a new query window. 6. Run the following command to bring the database out of restoring state. 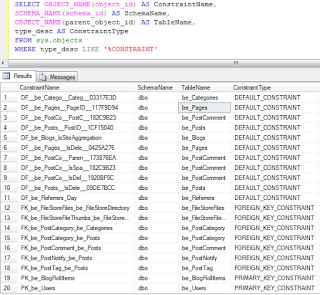 In this post, I am going to explain how you can list all CONSTRAINT of database or table in SQl Server. When you are working on database sometimes you need to check or get the CONSTRAINT on database or table. Using below given query we can get the CONSTRAINT of table or database quickly. Using above query we get all fields of sys.objects. The last, replace the Student_Register with your database table name. SQL Server 2016 Hosting - HostForLIFE.eu :: How to Save Picture in SQL Server with ASP.NET ? This article will explains the way to Save pictures In Sqlserver database In Asp.Net using File upload control. I am upload the pictures using FileUpload control and saving or storing them in SQL Server database in ASP.NET with C# and VB.NET. 1. ID Numeric Primary key with Identity Increment. 2. ImageName Varchar to store Name of picture. 3. Image column to store image in binary format. Sometimes, you may want to delete rows because they are no longer needed, or they were incorrectly added in the first place. The DELETE statement is used to remove rows from a SQL Server table. A single DELETE statement can remove a single row, or number of rows. In this article, I will explore how to remove rows from a table using the DELETE statement. ( expression ) - is a number or an expression that equates to a number used to limit the number of rows deleted. In order to demonstrate how to use the DELETE statement I will be creating a DemoDelete table. Here is the code I used to create and populate my DemoDelete table. In this code I used the DeleteDesc column to constrain the records that I would be deleting. By specifying that the DeleteDesc column value had to be equal to the value "The Mother", only one record in my table got deleted, because only one row in my table had that value. Now if my table contained a number of rows that had a column value of "The Mother" then all the rows that contained that value would be deleted. If you are unsure of the rows you are identifying to be deleted using the above example, and you want to make sure the rows you have targeted with the WHERE constraint are correct, then you can first run a SELECT statement. After you are confident that your SELECT statement is selecting the rows you want to delete you can then convert it to a DELETE statement. This statement deleted a random row from my DemoDelete table. It was random because SQL Server does not guarantee a sorted set will be returned where it can delete the top record of the ordered set. When I review the records left in my table I see I deleted the record that had an Id value of 1 and a DeleteDesc of "Thing One". Note if I change the TOP clause to another number like 3, then this statement would delete the number of rows equal to the value specified. In the above code I create a subquery that returned a single ID value based on the descending sort order of ID column value in my DemoDelete table. I then used the WHERE constraint to only delete records that had that ID value. I also place a TOP (1) clause on my DELETE statement to only delete a single row should my DemoDelete table contain multiple records with the same ID value. If you are following along you can see the above code deleted the DemoDelete record that had an ID value of 7. When I run this code against my DemoDelete table it will delete ID value of 5. This code joins the table DemoDelete and RecordsToDelete based on the DeleteDesc column. When the DeleteDesc matches between the two tables the matched rows within the DemoDelete table are deleted. These returned rows could be used by your application for some purpose, like creating an audit trail. In this code sample I first created a table to contain my deleted rows. This table is a table variable name @DeletedRows. Next I ran my DELETE statement. This time my DELETE statement specified the deleted row output was to go into my table variable. That specification was made using the INTO clause of the DELETE statement. In both of my examples that used the OUTPUT clause of the DELETE statement I specified "DELETED. *" to denote outputting all the column values for the rows being deleted. I could have specified the actual column values I wanted to output. The code below is equivalent to the code above. In this code you can see I specified "DELETED.ID, DELETED.DeleteDesc", instead of "DELETE.*". You can verify this code is equivalent by inserting the "The Cat" row back into the DemoDelete table and then running the code above. As you can see there are multiple ways to delete rows from a SQL Server table. You can use the WHERE clause to identify specific criteria for the rows that need to be deleted. You can join a table to the table in which you are deleting rows to identify which rows to delete. You can even use the TOP clause to restrict the number of rows that will be deleted. The article should help you with developing your DELETE statement next time you have to remove some rows from a SQL Server table. Need your urgent help. In recent past, we have been attacked by the hacker who was able to get in to our SQL Server via sysadmin account and made big damage to our data. 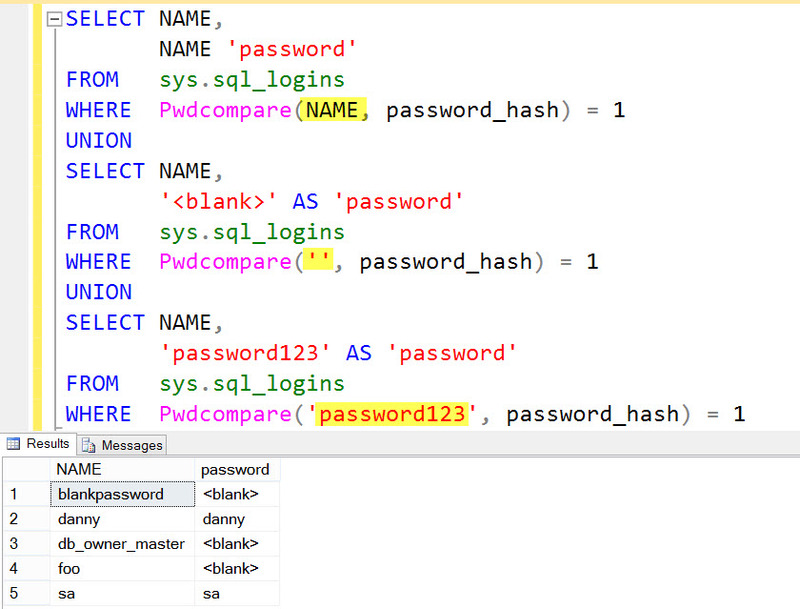 To make sure it doesn’t happen in future, I have taken task to find out SQL Server password which are weak. This is one of the area which is always haunting all SQL DBAs. There are recommendations to use Windows Authentication to connect to SQL Server and that would save from all such problem. But it is not always feasible to use Windows Authentication. Now, if you decided to choose SQL Authentication, there is a setting which is “Enforce Password Policy” which would ensure that you are choosing a strong password. These are one of the most common password used in the industry. I am sure you can extend this further by modifying it and adding more weak passwords. Hope this article would help you in finding weak passwords and make it more complex. Try our SQL Server 2014 with Free ASP.NET Hosting today and your account will be setup soon! You can also take advantage of our Windows & ASP.NET Hosting support with Unlimited Domain, Unlimited Bandwidth, Unlimited Disk Space, etc. SQL Server 2014 with Free ASP.NET Hosting - HostForLife.eu :: How to Return More Than One Table from Store Procedure in MSSQL Server? // Retrieving total stored tables from DataSet.